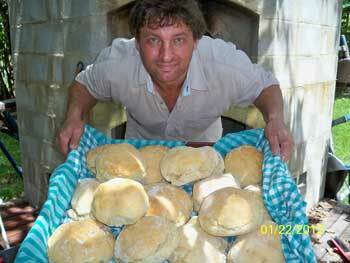 There is NOTHING as satisfying as opening your wood fired oven to see it full of perfect, puffy, golden loaves, and then (as you let out the breath you've been holding and take your first satisfied breath in), inhaling that tantalising aroma – the smell of success, of real homeliness, of YES, I-CAN-BAKE! 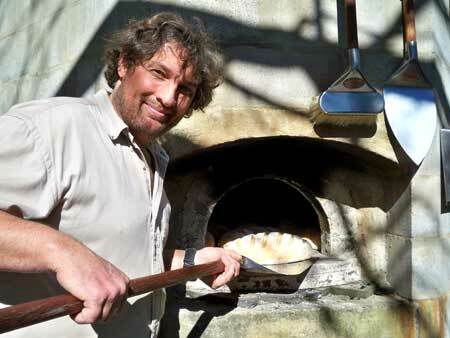 Before we got our wood fired oven, my bread making experiences were nothing to wax lyrical about and I certainly never aspired to bread greatness. 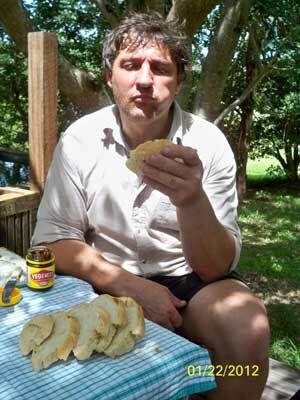 I never even really aspired to bread averageness. I just thought it was too much trouble for too little reward and that I clearly didn't have 'the knack' and so the most useful bread skill I could work on was the ability to, from the smallest of across-the-road clues, identify the marks of a good Italian deli or Vietnamese bakery or French patisserie. A place where I could buy Bread-To-Die-For from. 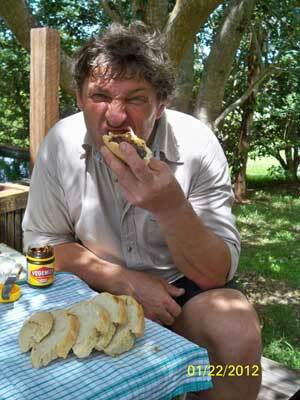 These days, while I'm still a long way from being a bread expert, or a bread fanatic, I can now hold my head up high, plonk my loaf on the table, turn around and know that when I turn back, my bread will be gone – it's that good - and that's good enough for me! Sooo, without further ado, let me cut the ribbon, crack the champers on the bow, call for the drum roll and introduce you to our complete (and boy, do we mean complete!) 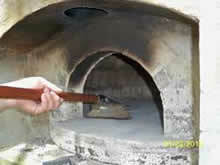 Wood Fired Oven Bread Making Guide. Naturally enough, being a relative newbee myself, I'm only qualified to be in charge of the Beginner's Bread Lesson and I can’t do much more then start you on the path (and take photos of Pete as illustrations – he’s much cuter to look at then I am and also endearingly hopeless with a camera, so he gets to be the model). 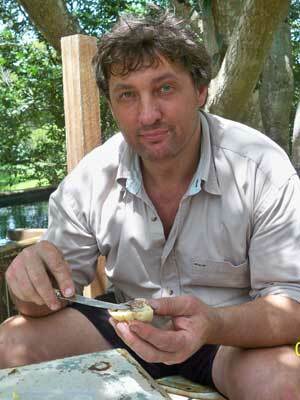 Fortunately though, amongst our customers we have some real bread experts. In the future, we may even con a few more of them into writing as well, but for now, if you've already graduated from bakery primary school and you're ready for some serious study and real skill, or if, for you, bread making is a religious experience and you worship at the altar of its graininess and purity and you want to be inducted into its mystik secrets, then please skip my waffle below and jump straight to the contributions of our two bona fide Bread Stars - Scott Megee with his Advanced Bread Recipes For Your Wood Fired Oven and Graham Prichard with his Sour Dough Bread Making Secrets. There are quite a few versions of this basic idea around and you can find quite a few books and magazine articles on the subject if you have a bit of a hunt for them under 'Artisan Bread', 'No Knead Bread', 'Quick Bread', etc. 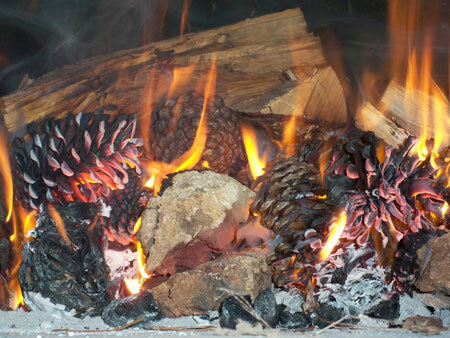 I've been searching out these recipes for a good 6-8 months now and adapting them to suit the wood fired oven, and this recipe - a composite of those techniques that work best in the WFO - is just about foolproof I reckon. It's incredibly adaptable - you can play with the time, the batch size, the type/s of flour, the loaf shape and add all sorts of ingredients and no matter what you do, it'll still work out delicious. The big advantage of a no-knead recipe though (apart from the obvious!) is, if your just starting to learn about your oven AND just starting to learn about baking bread, then that's quite a lot of variables to be juggling at once and you can make (and eat!) 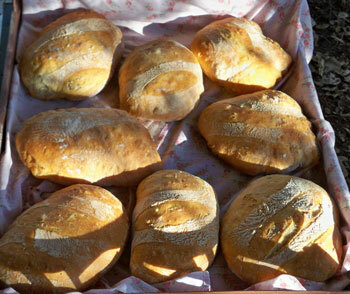 a lot of not-so delicious bread while you work it all out. A no-knead recipe lets you concentrate on practising your oven techniques like how to soak the oven with heat, how to remove the coals, how to use your door, how to use a mop to create moisture and be confident that you understand the effects of your actions, without having to stress about your bread at all - it's going to be no drama and it's going to taste great - there really is no-knead to worry! 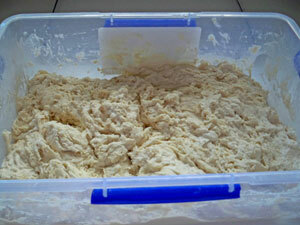 The only disadvantage I can see to a no-knead recipe is that it takes up a lot of fridge room. Essentially, you're swapping the mess and fuss of kneading for a slow dough rise in the fridge, so you might have to make a few sacrifices (let the beer be warm, let the chocolate melt, but keep the dough cold!). 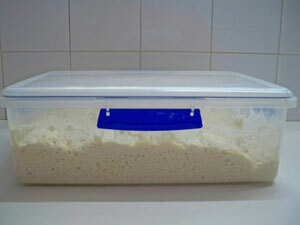 Okay, well first things first, you need a lidded container for your dough to live in. Anything will do, as long as it's large enough to hold the expanding dough (triple the original dough-mass) and it has a lid that will sit on top, but doesn't have to be totally sealed or tight (if you seal up a preserving jar-type lid for instance, you could potentially create a dough bomb and the power of bread should only be used for good, not evil!). I find the 7 litre rectangular Sistema Klip-It plastic containers with the blue trim (available from supermarkets everywhere here, see pictures) fit the bill nicely AND they're made in New Zealand, which is nearly as good as being Aussie made, isn't it?! Okay, into your container place: 2¾ cups lukewarm water, 1½ flat-ish tabs granulated dry yeast, 1½ heaped-ish tabs coarse sea salt. 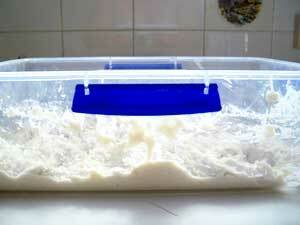 Stir it around to combine, but don't worry too much about any little yeast lumps – they'll disappear. 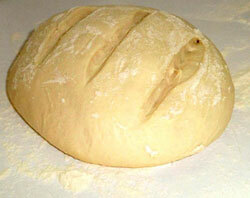 Dump in 6 loose cups of bread flour and use a wooden spoon or wet hands to combine the dough. Now remember, this is a no-knead dough, so don't work it. All you're after is a vaguely uniform consistency to your mud pie – the mix is going to be mushy and wet and won't hold into a ball or anything – just mix it for a minute or two so there's no great lumps of dry flour and THAT'S IT! Well, that's not really it, but its pretty close. All you have to do now is to just put your lid over the top and put your container in a warmish place and leave it there for 2-5 hours (you want the dough to rise up and collapse down slightly) then put it in the fridge and forget it for at least a day. How good is that? Bread made, no mess to clean up AND you can make your dough up to 10 days in advance and the taste will just get better – told ya we'd only use our powers for good! 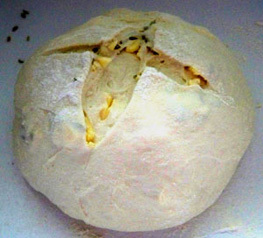 Dough Mixed ~ from side. 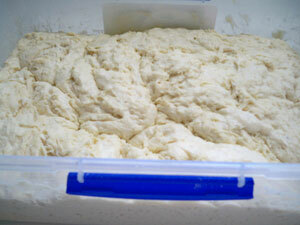 Dough Mixed ~ from top. 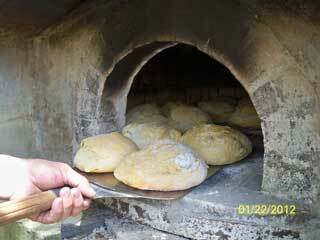 Dough Risen ~ from side. Dough Risen ~ from top. So, when baking day rolls around, IT'S ALL ABOUT THE OVEN (see next section). You don't knead/need to worry about your bread until about 30 mins before you want it to go in...! When you're nearly ready to bake, you're going to want a nice bit of clear, dry, bench space, an open packet of bread flour and a small, pointy serrated edged knife - a steak knife is ideal - or, if you are doing industrial/commercial sized dough amounts, then you need our Dough Cutter instead. 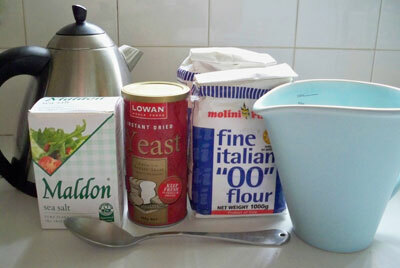 Take your dough out of the fridge, open the container, dust the knife blade and the top of the dough with flour and then cut the dough into 4 equal pieces. Flour the bench fairly well, then flour your hands and scoop one of the pieces of dough out and onto your hand (flour side down), then flour the other side (the side that was the bottom layer in the container and is now on top). 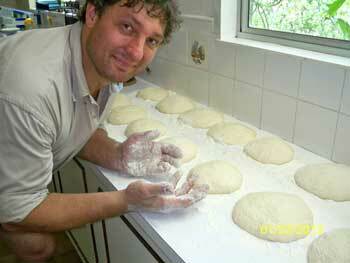 Okay now, here you are, holding your dough ball in your two hands. This next bit is a bit hard to describe but, bring your thumbs in till they nearly touch above the centre of the dough ball and then put your thumbs down on to the dough and use them to gently stretch/drag the mix from the centre top of the mass around while at the same time using your other fingers to kind of tuck the stretched bits up under the rest of the dough ball. 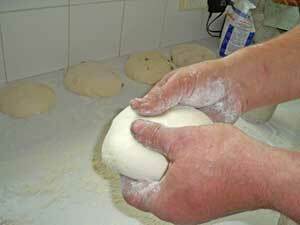 Bring your thumbs in till they nearly touch above the centre of the dough ball. 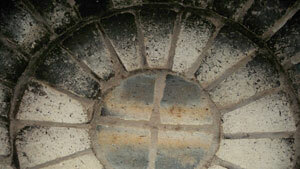 Use your thumbs to gently stretch/drag the mix from the centre top of the mass around. 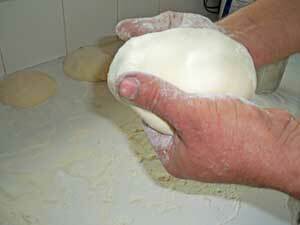 Use your other fingers to kind of tuck the stretched bits up under the rest of the dough ball. 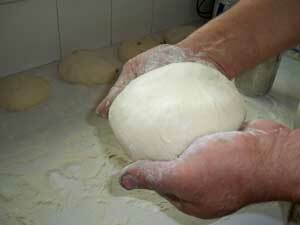 Rotate your dough ball a quarter of a turn and repeat from step one above until ball is smooth. 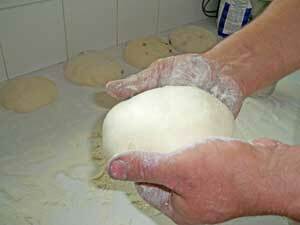 Be a bit gentle - you want to stretch the strands of dough, not break/rip them too much. Do this at least four times - rotating the ball a quarter turn each time - until the top of the dough ball is nice and smooth, the shape is round and the bottom is a lumpy mass of ends all neatly tucked up and hidden from view (actually eight times, or two complete rotations might be more realistic before it looks like the pictures here!). Flour the top and bottom of your ball again, then put it down on your (floured) bench. Leave your dough balls to sit out on the bench for no more than half an hour to relax slightly and when you're ready to put your loaves in the oven, use the point of your (floured) knife to make 3 parallel slashes across the top of the loaf. You want the knife to go about a third of the way through the dough. BTW, if you don't want to bake all four loaves at once, get the container with the remainder of the dough in it back in the fridge as soon as possible. 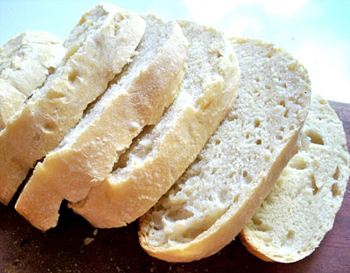 Remember, your dough will keep in the fridge for at least ten days and in fact, the longer you leave your dough to slow rise, the more complex and finer textured your bread will be. 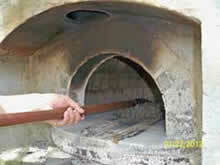 Your wood fire oven needs to be well soaked with heat to make good bread - a solid 2 to 3 hours with a nice, medium size, stable fire going and the door open will do it. Because getting to a well soaked oven - one where the floor, the walls and the air temp are all evenly activated - requires a bit of effort and uses up precious fuel, it's always a good idea to make the most of a serious firing. Make 20 loaves of bread, plan a roast or quiches or pavlovas or something for afterwards, but don't waste that lovely lux heat, it's just too special a cooking environment. If you want a few pizzas first, go for it. 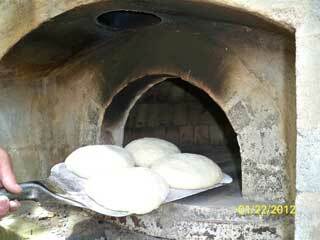 In fact, you may be pleasantly surprised to see the difference that the soaking heat makes to your pizza dough too. 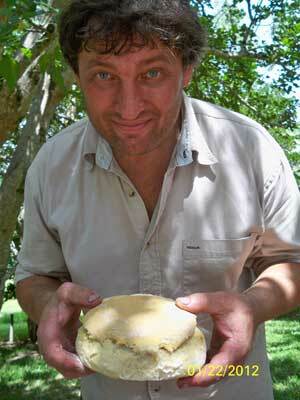 A lot of beginners report their first real 'crust' success with a soaking fire. When you've removed the coals from the oven, give it a good sweep or pat (to remove the small bits of ash or grit from the floor) and then scatter a bit of flour on the floor and make sure it's not too hot. If it incinerates immediately, wait 10 mins and try again. If it’s still too hot, use your mop to reduce the floor heat, or just wait it out. When the flour takes at least a couple of seconds to colour up and then disappear (i.e., when the process is slow enough that you can observe the flour toasting! ), you're in the zone. So, as soon as possible after removing your coals and cleaning the floor with a sweep or a pat, mop your floor over with a well-soaked-but-not-ringing-wet mop, or if you don't have a mop, push a well-soaked-but-not-ringing-wet old towel around the floor with a stick. There are two reasons why you want to create some steam at this point. Firstly, it evens out and slightly reduces the floor temperature, so that when you put your loaves in, their little bottoms definitely won't burn. Secondly, the intense, moist heat 'explodes' the protein in the flour, giving you a magnificent crusty top if you work quickly enough to get the loaves in and the door in place before the steam all dissipates. Anyway, plug over, so you've got your loaves in and the door closed nice and quickly? Nothing to do now except get ready to gloat. 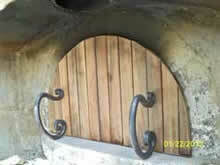 Oh, also, you do have to resist the temptation to open the door (and that can be hard!). You need to wait at least 20 minutes for your loaves to cook. After that, you can risk a peak. Well, a feel and a tap will probably be more help! 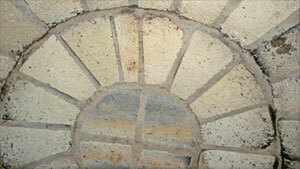 You're looking for your loaves to feel 'set' and quite light and for there to be a nice hollow sound when you tap them. If it's not happening, get the door closed ASAP and check every 5 mins until it does. 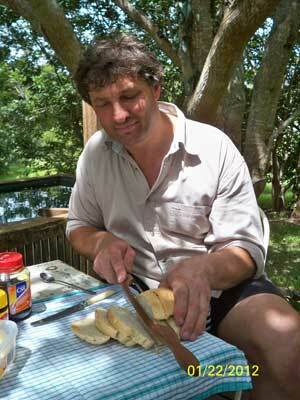 When it's done, pull your bread out and put it on a rack or a tea towel to cool. Incidentally, great bread will 'talk to you' - the crust will crackle as it hits the outside air - and what it's saying to you is "try not to eat me all straight away". 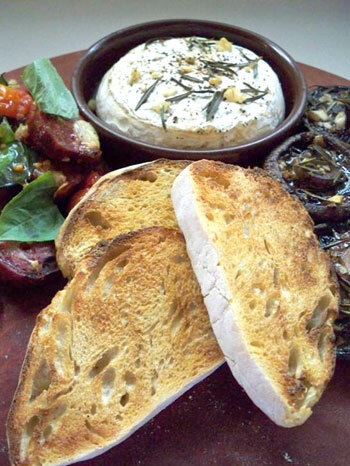 Good as this bread is straight from the oven, it's even better as bruschetta or toasted. It'll get that lovely, chewy ciabatta quality to it and that's definitely worth a bit of a wait! 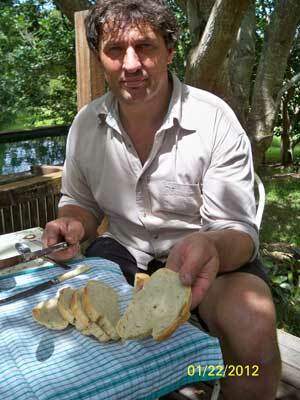 Once you've got your basic bread cooking technique down pat, it's easy to go off and try more complicated/traditional bread recipes, because you'll be confident that you know how your oven behaves. That said, this no-knead bread is very tasty (remember, the longer you leave the dough in the fridge, the more complex and sour-dough like it becomes), easy, consistent and the possibilities (both savoury and sweet) are endless. 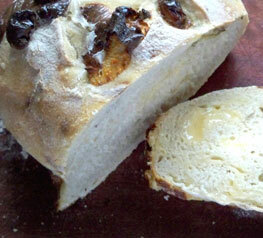 Or, just to prove how versatile this recipe is, how about making yourself a loaf or two of the world's best raisin toast? All you have to do is, the day before you make your dough, soak a packet of raisins or sultanas in a mix of Medium Dry Sherry and/or cold black tea. Leave them to soak for half a day, strain the liquid off (keep it for use as a glaze) and then leave the fruit in a bowl, sitting uncovered on paper towel, in the fridge for the rest of the day to drain. When you go to make your dough, just use ½ the salt in the yeast mix and when you add your flour, also add 1 cup of sugar and your raisins/'tanas before you stir the mix together. The only other thing you may need to watch with making sweet dough this way is not to leave the dough out for too long - just leave the dough out for 1 - 1½ hours on the bench and then get it in the fridge. At room temp., sweet dough won't collapse once it's risen a bit, it'll just keep growing until it takes over your whole kitchen! Oh nearly forgot, you don't need to do this, but if you keep 2 tablespoons of your sherry/tea liquid and add 1 tablespoon of sugar to it, this makes a great glaze. Just paint some over your dough before it goes into the oven and again when it comes out and you'll have that wonderful dark, traditional raisin bread crust. We usually fire up the oven for a serious cook-up on Sundays anyway, so it's no trouble to get our week old dough mix out from the fridge and do our bread as per the recipe above. As soon as we've got the dough out onto the bench and into loaves and they're all having their ½ an hour snooze, I then remake the next weeks dough mix straight into the just emptied containers. Yes, that's right, not only no knead, but no washing up either and the carry-over of the little bits left in the container from the previous batch just intensifies the dough's natural yeasty flavour - a kind of pate ferment (as Scott – the Advanced Bread Making Teacher - might say!). Anyway, whatever it is, this adaption of ours - the No-Knead Even To Wash Up Variation, as I like to call it - really works for us AND seems to work for our nearest and dearest as well. In fact, I'm embarrassed to admit that we have actually worked our way up to doing 4 containers of dough mix each week (that's approx 16 loaves, folks!) and there ain't a lot left for toast the following Saturday morning, let me tell ya! Before you call the gluten police though, please rest assured that, much as we like it, Pete and I don't actually eat the whole 16 loaves by ourselves, but the bread has become nearly as good as hard currency in our world - we swap it for eggs, for candles, for horse poo and the like and occasionally, we even give it away, but we have to really like you to do that!